PULZAR Z-1 GREASE is a lithium-based grease that contains a unique combination of rust and corrosion inhibitors and a whitening agent to differentiate it from other substances and detect contaminants. The off-white color makes it ideal for applications where using dark grease could cause potential product spoilage. The solid color additive also affords mild extreme pressure protection. 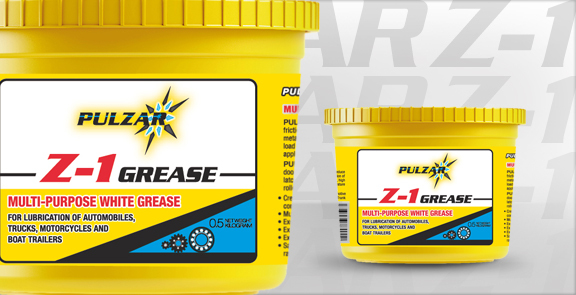 PULZAR Z-1 GREASE exhibits excellent shear stability with little change in consistency during use or storage. Because of its buttery smooth texture, it pumps well through all types of pressure systems, including centralized lubricating systems. bearing moving metal surfaces and/or the combination of metal and plastic surfaces. It is characterized by mechanical shear stability, high load carrying ability, high temperature applications and resistance to water, oxidation and corrosion. PULZAR Z-1 GREASE is an excellent lubricant for automotive wheel bearings, automotive door hinges, hood latches, interior window mechanisms, radio antennas, trunk latches, hatchback struts and seat tracks. Industrial uses include ball and roller bearings where NLGI #3 lithium grease with mild extreme pressure protection is required.